Jimmy Kimmel returned with his baby Billy after heart surgery and held back tears as he urged congress not to put tax cuts ahead of child healthcare. 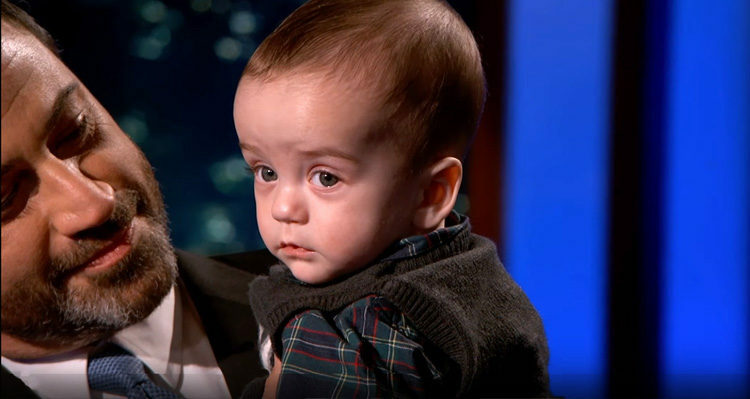 There wasn’t a dry eye in the house as late night host Jimmy Kimmel walked on the stage holding his baby boy Billy, who had his second open heart surgery last week. CHIP is the Children’s Health Insurance Program. It covers around 9 million American kids whose parents made too much money to qualify for Medicaid but don’t have access to affordable coverage through their jobs which means it almost certain covers some children you know. About 1-in-8 children are covered only by CHIP and it’s not controversial, it’s not a partisan thing. In fact last time funding for CHIP was authorized it was 2015 – it passed by a vote of 392 to 337 in the House and 92-to-8 in the Senate – overwhelmingly. Democrats and Republicans supported it until now. Now CHIP has become a bargaining chip. It’s on the back burner while they work on their new tax plans which means that parents of children with cancer, diabetes and heart problems are about to get letters saying their coverage could be cut off next month. Merry Christmas, right? “This is literally a life and death program for American kids. It’s always had bipartisan support. But this year [Congress] let the money for it expire while they work on getting tax cuts for their billionaire and millionaire donors,” he continued. Imagine getting that letter literally not knowing how you will afford to save your child’s life. This is not a hypothetical. About 2 million CHIP kids have serious chronic conditions. I don’t know – I’ve had enough of this. I don’t know what could be more disgusting than putting a tax cut that mostly goes to rich people ahead of the lives of children. Why hasn’t CHIP been funded already? If these were potato chips they were taking away from us we would be marching on Washington with pitchforks and spears right now.